In my last post I documented how Nancy MacLean, the author of the new book Democracy in Chains, misused evidence to depict a non-existent intellectual debt between the economist James M. Buchanan and a group of pro-segregation Agrarian poets from Vanderbilt University. MacLean’s primary purpose in doing so was to prop up her own narrative, which portrays Buchanan’s role in the development of Public Choice economics as having been motivated by resentment over the Brown v. Board decision. This claim is not supported by any evidence in Buchanan’s works either. I’d like to turn to another similarly unsavory claim in MacLean’s book next, that of John C. Calhoun. As with the Agrarians, MacLean attempts to place Calhoun at the center of Buchanan’s work and the Public Choice school of thought more broadly. She minces no words in advancing this claim. At the outset of the book she declares Calhoun the “intellectual lodestar” of Buchanan and his heirs. 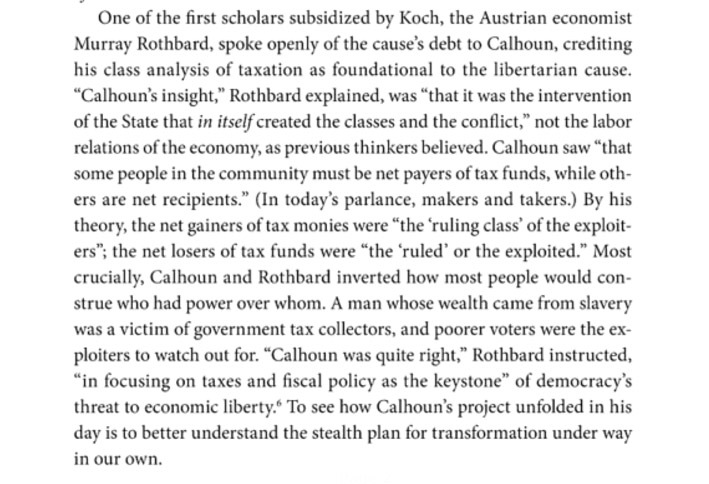 She similarly describes Calhoun as a “recurrent theme in the brain trust” of scholars funded by the Koch brothers and devotes the prologue of her book to belaboring the different ways in which Buchanan is allegedly a secret Calhounite. MacLean’s argument runs into an immediate problem though. As with her claims about Donald Davidson and the Agrarians, Calhoun’s name does not appear anywhere in the 20 volume Collected Works of James M. Buchanan. To get around this complete deficiency of evidence, MacLean again resorts to her own imagination to forge the link nonetheless. She starts by enlisting a highly conspiratorial reading of a scholarly article by Tyler Cowen and Alex Tabarrok on a few similarities between Public Choice voting rule insights and Calhoun’s theoretical concept of the concurrent majority. The article itself is innocuous and steeped in textual analysis of this narrow point. Simply discussing Calhoun in a scholarly argument does not, after all, make one a Calhoun acolyte. Even Richard Hofstadter, the progressive historian who MacLean cites for her chapter title (and then conveniently neglects to read) conceded that Calhoun was “the last American statesman to do any primary political thinking.” Surely that recognition does not make Hofstadter a secret aficionado of plantation slavery. MacLean is almost wholly uninterested in an intellectual discussion of the complexities of Calhoun though, preferring instead to enlist it as “proof” that Buchanan had somehow instilled Calhoun’s pro-slavery principles into his colleagues and proteges – and all despite never once mentioning his name. There is a far simpler explanation, of course. Buchanan’s Calculus of Consent was rooted in an exploration of James Madison’s theory of federalism, and in particular the use of constitutional mechanisms to constrain factional captures of legislative majorities. Calhoun similarly developed his concept of the concurrent majority as an extended commentary on Madison. Quite simply, any similarities between the two arise from the fact that they were both engaging the same well known arguments of the same author. Still, a single 1992 article about Calhoun’s concurrent majoritarian theories by two faculty colleagues of Buchanan falls far short of a basis from which to write Calhoun into Buchanan’s own work from the 1960s. This is where MacLean gets creative. From there it is but a small step to point out Calhoun’s radical defenses of slavery, and thus tarnish Buchanan and Public Choice theory with that brush. MacLean’s argument neglected to account for a substantial complication. Rothbard, it turns out, was no fan of Buchanan or The Calculus of Consent, his main work (along with Gordon Tullock) on majoritarian constitutional mechanisms. In a 1960 essay for a book reviewer, Rothbard harshly criticized the work and specifically argued that it fell outside of the main body of libertarian political theory. 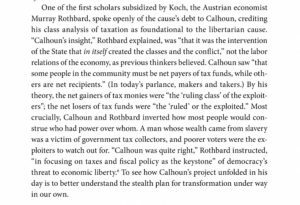 Rothbard concluded by stating that the thought “the nub of the entire analysis of the book…is utterly and absolutely wrong.” Buchanan, for his own part, was not particularly fond of Rothbard’s contributions either as Don Boudreaux points out. Once again, Nancy MacLean went casting about for a link between James Buchanan and unsavory connections to white supremacist viewpoints – this time by way of Calhoun. Once again, she was unable to find any evidence of that connection in Buchanan’s own works. So what did she do instead? She invented one by stringing together other sources that do not actually show what she claims they show. And in fact, she failed to realize that the the author she uses to build a link from Buchanan to Calhoun – Murray Rothbard – was deeply hostile to Buchanan’s own work, directly contradicting her claimed link. 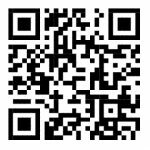 This entry was posted by Phillip W. Magness on Thursday, June 29th, 2017 at 3:10 am	and is filed under Uncategorized. You can follow any responses to this entry through the RSS 2.0 feed. Both comments and pings are currently closed.